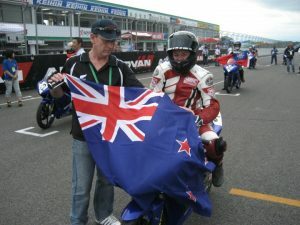 Avalon gets wildcard entry for 2011 Phillip Island 125 grand prix! We are excited to announce Avalon will be making her debut in the world championships at the 2011 Australian MotoGP event on October 15/16th. Riding in the 125gp class, she will be aboard the honda rs125 she rode in the New Zeland championships with some extra modifications. Due to a limited budget, the bike will be down on top speed compared to the world championship regulars, but the team are simply looking forward to enjoying the experience of racing with the ‘top dogs’ of 125gp racing. You can read more about the wildcard entrants here. After a relaxing off-season from racing, things have been all go for me lately with lots of exciting news to share. Two weeks ago I had my first race on the CBR600RR I will be racing this coming summer in with Wolf Pack Honda Racing. It was an awesome weekend down at Manfeild raceway and after 3 days riding and one day racing I was feeling really comfortable with the bike and managed some solid top 10 finishes in the F1 class. Huge thank you goes out to Jamie for setting up the team for the coming season, I can not wait for it all to kick off! Dad and I then had three days at home before heading to the airport – Japan bound for a round of the FIM Asia road race championships. NZ was invited for the first time so I was pretty excited to represent our country. 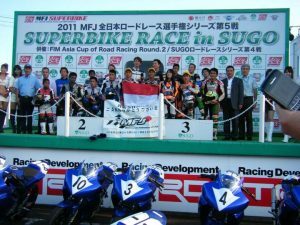 The race was held at Sugo aboard 150cc four-strokes and featured 18 racer’s from Singapore, Taiwan, Indonesia, Thailand, Phillipines, India, Sri Lanka and Korea. 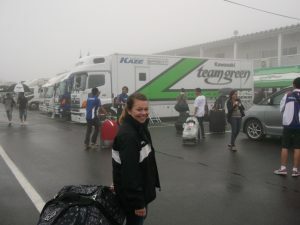 The two Japanese entrants were also girls so they were very happy to have another female join the racing and we became good friends over the weekend. The riding kicked off on Friday with two 20min sessions on a damp track. Most of the day’s practise had been cancelled due to heavy fog – it was pretty hard to learn a new track when I couldn’t see more than 20metres ahead! There was about 5+ guys crash in the session! I also had to adjust to the style required by the smaller bikes. I managed to secure 8th on the grid during qualifying, but had a slide down the road during the qualifying session which saw me miss quite a few laps as the bike wouldn’t restart again. Race 1 was held Saturday afternoon where I finished 11th. The Indonesian riders were very dominant out front, followed closely by the Thai team and the Pilipino 600cc champion. Sunday morning I tagged along with some fast guys during warm-up and was going a lot better until the small bracket for holding the side stand dug into the track and launched me off. After this we asked for it to be rounded off with a grinder and I had a bit more confidence for the race. Got a better start and ended up 9th at the finish. I think the results speak for themselves just how competitive the racing was over there. Mostly everyone in the field was national champions in a race class and many of them were professional racer’s. To come away with a top 10 finish was a good result and they are very keen to invite New Zealand back again next year so hopefully that means Dad and I did a good job representing us. Thanks for Dad for his organisation and MNZ for letting me take this opportunity. This event was held at a round of the All Japan Championships so we saw their very exciting fields of 125GP, 250 mono, 600 and superbike racing. Also caught up with a couple of Australian riders I have raced with on 125GP and as they are competing in the Japanese Championship series gave us more insight into the racing here. The FIM Asia event was hosted by the Japanese Motorcycling Federation who did an amazing job of hosting and immersing us in the Japanese culture. Huge thanks to Mr Goto and Mrs Eda for their efforts. It was awesome for me to meet and learn from riders from such different cultures and I think the experience will make me a much better racer after seeing their techniques!